Ensure a well-used, much-loved community pool remains open. Operational skills e.g. customer service skills, Health and Safety, etc. Community business skills – managing community buildings, finances, etc. for Trustees – MRB CIC is currently in the process of registering as a Charitable Incorporated Organisation. Ensuring that public swimming opportunities continue. Swim training fees – £2,360 – £295 Lifeguard course p.p. + £2,400 – £300 Swim Teacher p.p. Whilst MRB CIC fight to keep swimming, a coalition of organisations – including MRB CIC, Friends of Moseley Road Baths and the National Trust – is seeking capital funds to deliver urgent repairs and develop a sustainable, long term plan for the building’s use in the future. Can you help with a clean up? The Friends of Moseley Road Baths coalition with the Action Group, National Trust, Historic England, World Monuments Fund and Birmingham City Council is in the process of producing a comprehensive business plan to aid the retention of swimming at the Baths after March 2018. This also involves instigating a fundraising strategy that will help develop the early stages of the swimming operation. The next event to be held at the Baths will be on Saturday 21st October 2017 as part of this years Fierce Festival – https://wearefierce.org/events/from-chibok-to-calais. The event will be staged in the Laundry Room situated at the top of the Baths building and will be free to attend. Access to this area is via two sets of steps behind the entrance to the Plant Room. Following Birmingham City Council’s decision to keep MRB open until March 2018, the Friends of Moseley Road Baths are able to organise another open day as part of Birmingham Heritage Week. We will be conducting guided tours and will also be recruiting volunteers to help progress this bright future for our globally recognized Grade II* listed building. Come along on Saturday 9th September, 10am-4pm – there will be plenty of opportunity to learn about what is currently happening with the work to retain swimming at Moseley Road Baths and learn about the history of the building. To book a tour ‘behind the scenes’, here or phone Mark Gunton on 07801 444 075. The release of a new film produced in conjunction with the World Monuments Fund which invited individuals to come and share their memories and stories about the Baths. 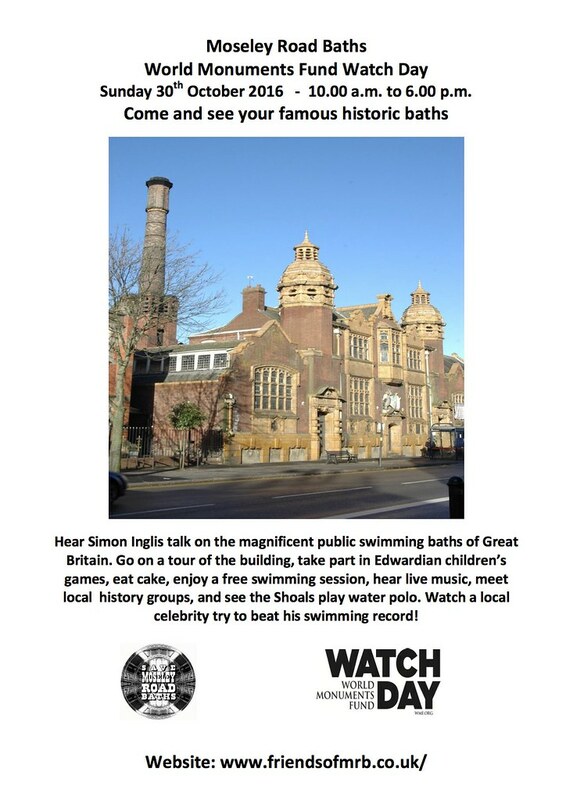 An invitation to members of the public to share their own pictures of them visiting the Baths using the hashtags #keepswimmingmrb and #moseleyroadbaths on Facebook, Twitter or Instagram. Details will be posted on the Friends of Moseley Road Baths website, Facebook page, Twitter and Instagram. Just before Christmas we asked you to come along to the Baths on a Sunday morning to share your thoughts about the building. Today we learnt that one of our interviewees, David Taberer, passed away suddenly last week. David and his wife Linda had travelled all the way from Droitwich and were first in the queue to be interviewed. David was absolutely charming and so passionate about his old neighbourhood. We are very pleased to share David’s interview with you all at this time. He grew up in Balsall Heath, and like so many of you on here grew up with the Baths as his playground (along with the bomb pecks!). He recalls friends diving from the Gala Pool balcony and getting a certificate for a quarter mile. Why do you love Moseley Road Baths? Interviewees needed! 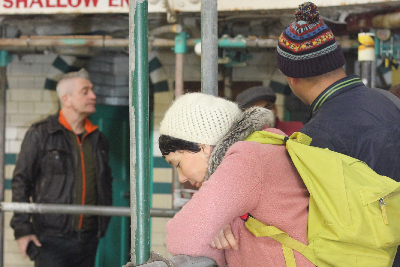 The World Monuments Fund have asked the Friends to produce a short video in which users and supporters of the baths talk about why Moseley Road Baths are important to them and why the building and the swimming baths should be saved. As you probably know by now this year is the 10th anniversary of the Friends of Moseley Road Baths who have campaigned to keep the Baths open. The future of the Baths is now probably at a more critical stage than ever, with closure due to take place in June 2017. Sparkhill Baths is due to open then and so the continued existence of the baths needs a really sustained campaign over the coming months. If you would like to be involved in a short interview then please come along on Sunday 18th December, 10-12 to say a few words on camera.